The Chevrolet Astro Van was General Motors’ first entry into the minivan wars of the mid-1980s. Dodge had the Grand Caravan, and Ford had the Aerostar. 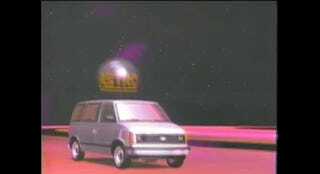 They were all boxy people carriers but the Astro van had the advantage of being from space—and rendered in glorious CGI. I bet the Aerostar didn’t even have half as much “cockpit instrumentation” as the Chevy Astro. This was an important time for minivans because Detroit’s Big Three had to try and outdo each other at every turn until they were crushed by Japanese auto manufacturers. Chevy thought they could make the Astro the coolest van by taking the Astro name to its logical conclusion. That conclusion included space, modular seating, ‘80s computer graphics and of course, an entire family in matching red jumpsuits. Do you have what it takes to join the Chevy Space Corps with an Astro Van?